Why are all the ‘letter F’ E+ seats blocked? Why are the B & J seats blocked in rows 21 & 22 of E+? Same block in place for days before/after. Is this for a possible swap to PE frame? If so, what seats should I choose to get slotted into PE! It's the new, spectacularly ugly "placeholder" seatmap which is going to be used for the sUA 777-200ER fleet going forward. Hopefully they will bother to fix the cabin width and show the lavs and door between 7 and 8... by design every seat on this seatmap exists on any frame which might be swapped in, modulo the mess of F/J going to 2-cabin Polaris. The blocks are all F seats, 20CH, 21BJ, 22BJ, and 35ABCDE. If a PE frame is swapped in, rows 20-22 will become PE; otherwise additional seats may be added and/or unblock when the frame assignment is firmed at ~2am the third night before departure. Thanks for explaining. So the only way to guarantee two seats together, with at least one aisle, regardless of frame, and get PE in a converted frame, is DE in the first three rows of E+. Will select seats accordingly! Just another data point, but I noticed a few days ago on today’s UA89 (EWR-PEK) that the entirety of the A seat in E+ were blocked (and still are). But not the L row. Many aisle seats in E+ Remain open as well. UA89 and UA88 should still have the standard 777-200 v.2 seat-map which are the 50/217 (77Y) planes not scheduled for retrofit until the very end of the 777 line. Did UA89 really show this interim seat-map?? I'm seeing the same interim map UA835 ORD-PVG departing Oct 8. I'd like to try the new PE so I hope that will be it, but doubt I'll be that lucky. ah, didn’t catch the nuanced seat map in the original post. typical 772 seat map, just strange seat availability pattern. Everything I wanted to know about where to sit on 777-200 "version 6?" It bears a familial resemblance to the Version 5 Polaris but it's not that -- rows 20-22 are 2-4-2, row 30 is missing ABC/JKL (0-4-0) and then goes to the "normal" 3-4-3 for rows 31-37 and 41-50 (38 is 2-0-0, 40 is 3-0-3, 41-52 is 2-4-2, and 53 is 0-4-0) ... It also labels the cabins as "United Polaris First", "Economy Plus", and "United Economy" -- I thought the "Polaris First" moniker was going the way of the 3-cabin fleet. Anyway... what I'm most curious about at this point assuming the GPU fails to clear (I'm optimistic as it's currently showing J9/C9 but Y8/B5-- I'm currently in 40A (Exit Row Window -- a direct swap from my old 33A) the only other open E+ window right now is 31 which would appear to be missing the row in front. Curious if anyone can compare 31A to 40A -- legroom/recline specifically in this configuration. You want 20 to 22. They're the new Premium Economy seats which are much like the business seats of twenty years ago: spacious and comfortable with decent recline. They're available as E+ seats until United rolls out the soft product that will go with Premium Economy seats. 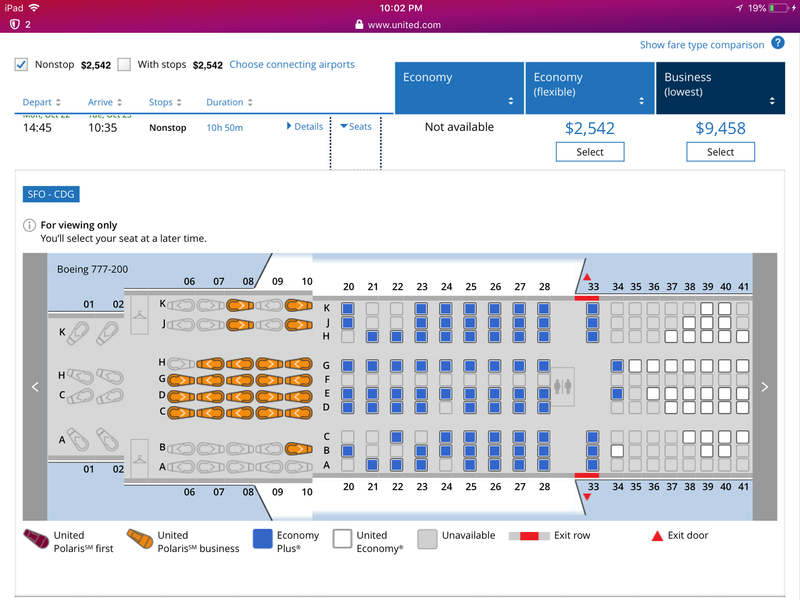 You are having a reconfigured 772 plane with the new Premium Economy seats that are not sold at this point as Premium Economy. They are only listed as Economy + but the lucky Economy + passengers that will get those seats (Rows 20 to 22) will get to enjoy much more comfort. I was sorely tempted to make a grab for those but have a strong preference for a window (and get mildly claustrophobic if I can't easily "see out") -- and 20-22 A/L are already spoken for, hence asking about 31A. If I were you I would immediately grab an aisle seat. The seat will we wider and there will be more recline. Obviously I never tested the UA Premium Economy seat but during the two years that I lived in the UK I only booked Premium Economy for long hauls on BA. Sometimes I took TODs but I did not worry if I could not upgrade as the Premium Economy seats were so comfortable. Maybe a compromise would be the seats next to the window seat. Usually you can see the outside (until the shades are lowered). Actually, with this plane your chances of upgrade increase. Only 27 out of 50 sold. I don't know how many passengers were booked in First Class in the original plane but if there were 0, Business would have been sold 27 out of 40. And then First Class could go out with some empty seats after the few upgrades to that class (with an instrument) and the non-revs. And the good news is that are plenty of window seats available in Polaris Business. I intensely prefer having a window seat, but for such a long flight as PEK-ORD, I would take any PE seat sight unseen over a regular E(/E+) window seat. Yes the extra pitch, legrest and footrest, and additional recline makes this an easy call. In terms of seat comfort, it's likely a bigger difference than domestic Y to domestic F (though not quite as much space shoulder to shoulder). I am on the inbound flight ORD-PEK. I plan to walk back to Y to check out the PE. I will check them out later today when I get on the flight, but I am sure the seats from 20 years ago are more spacious in the 2-3-2 configuration.